Alejandra Gomez, who is living in the United States without legal status, turns to face U.S. Sen. Martin Heinrich, right, at an immigration reform rally on May 1 after talking about the hole the deportations of her brothers leaves in her heart. “I just want you to know this is not a joke,” a crying Gomez told Heinrich. Standing before a crowd of more than 500 people and several television crews, Alejandra Gomez choked up as she tried to speak. The 22-year-old immigrant, a Mexican citizen living in the United States without legal status, raised her left hand to her face and wept. A number of political and religious leaders sat behind her on stage. The crowd was silent as Gomez took a deep breath, then spoke about the two empty chairs at family gatherings. Some in the friendly crowd at the May 1 event cried with Gomez as she described the hole the deportations of her brothers – Reymundo, 22, and Julio, 20 – leaves in her heart. Gomez’s brothers may not have the most compelling story to tell during a rally designed to shift public and political opinion in favor of immigration reform that grants legal status to most or all of the estimated 11 million people living in the United States without proper documentation. The two were deported last year after being arrested for stealing scrap metal. They’re being deported again after they were caught earlier this year trying to re-enter the United States illegally. Alejandra Gomez pauses to compose herself while talking about her brothers’ deportations at the May 1 rally in Las Cruces. 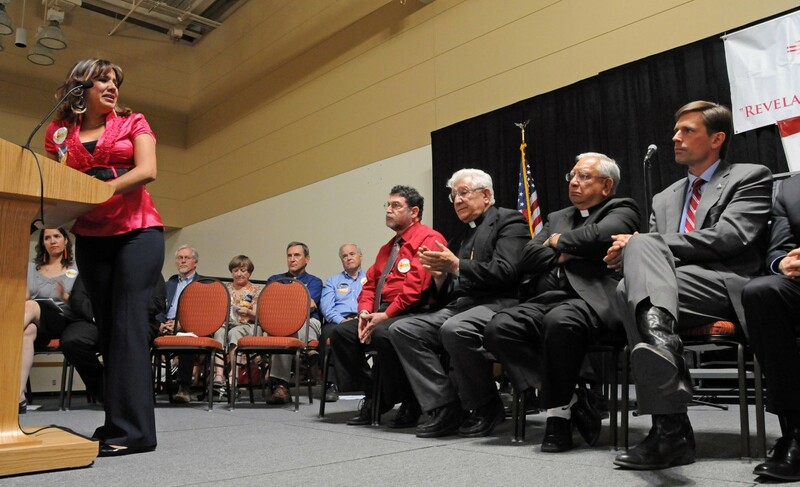 But there Gomez was, telling her brothers’ story during the Las Cruces rally. The faith-based immigrants-rights group Comunidades en Acción y de Fé (Communities in Action and Faith, or CAFÉ), sponsored the event. U.S. Sen. Martin Heinrich, who sat behind Gomez on stage, told New Mexico In Depth later that reform wouldn’t help Gomez’s brothers because of their criminal backgrounds. Her brothers aren’t bad people – they were just trying to make ends meet, Gomez responded in an interview with NMID. So she pushes on, telling her brothers’ story as a way to keep hope. At the Las Cruces rally, Gomez called her brothers’ decision to take metal from property they thought was abandoned a mistake. She said they tried to come back to the United States to flee drug dealers in Ciudad Juárez, Mexico who threatened to kill them if they didn’t sell for them. Toward the end of her speech, Gomez turned to Heinrich, a Democrat who has been supportive of allowing a path to citizenship or other legal status for immigrants living here without proper documentation. Seated behind her on stage, one leg crossed over the other, his hands in his lap, Heinrich locked eyes with Gomez as she spoke. “I just want you to know this is not a joke,” a crying Gomez told Heinrich. She later told NMID she was directing her frustration at the senator because, at the rally, he was the highest-ranking representative of a government whose broken immigration system, in her view, rips families apart. The federal government’s past refusal to fix its immigration system, Gomez said, exacerbates difficult situations that drive immigrants to make mistakes like the crimes her brothers committed. Heinrich stood and applauded along with others in the crowd when Gomez finished speaking. She turned from the podium into a hug from a friend. So-called dreamers like Gomez and her brothers – immigrants who were brought to the United States illegally as children – have become the public face of the immigration reform movement. People often find their stories more sympathetic than those of other immigrants because they didn’t choose to come here illegally, said U.S. Sen. Tom Udall, who met with Gomez and other immigrants during a tear-filled meeting in April. Udall, D-N.M., pointed out that a procedural block killed legislation that would give permanent residency to dreamers several years ago even though majorities in the House and Senate voted for it. The majority votes indicate the support dreamers enjoy even from Congress. By humanizing the issue, dreamers are helping lead a lobbying effort Udall, Heinrich and others say they hope will give comprehensive reform a greater chance than the last time Congress considered it. In 2007, a fragile compromise crumbled because some on the right opposed anything that could be called amnesty and others on the left disliked a new guest-worker program they said might have negative effects on wages and unemployment. Then-U.S. Sen. Jeff Bingaman of New Mexico was among the Democrats who helped kill reform that year because of his concerns about the guest-worker program. But times have changed. Heinrich and Udall told NMID that doing nothing again this year isn’t an option. Because of that belief, many Democrats are more willing to compromise than they were in 2007. They understand they have to find compromise with the GOP-controlled U.S. House. And Hispanics are becoming a more important voting bloc – one Republicans are heavily courting and Democrats can’t afford to lose. Dreamers have the numbers to be a significant lobbying force. The nonprofit Immigration Policy Center estimates that, of 85,000 immigrants living in New Mexico without legal status, there are almost 13,000 who qualify for Obama’s deferred action program or may in the future. The Pew Hispanic Center estimates there are as many as 1.7 million nationally who meet the requirements for the program, which grants work permits to immigrants if they were brought here illegally as children and meet other criteria, including not having felony or certain misdemeanor convictions on their records. But whether dreamers can give immigration reform the momentum advocates are seeking isn’t clear. The Senate passed a reform bill last month that provides a path to citizenship for most immigrants living illegally in the United States. Reform faces a more difficult road in the Republican-controlled House, where Speaker John Boehner says he’ll only allow a vote on a bill that has support of at least half of Republicans. Many House Republicans, including Steve Pearce of New Mexico, oppose the Senate bill and talk about securing the border before tackling other aspects of reform. Meanwhile, a provision in the Senate-approved bill that devotes $30 billion to deploying 20,000 new Border Patrol agents and adding hundreds of miles of fence along the border has angered many reform advocates and may lessen support from the left. Cynthia Alba, an 18-year-old immigrant, is working legally for the first time after receiving deferred action status several months ago. She met with U.S. Rep. Steve Pearce earlier this year to lobby for immigration reform. While not optimistic that Congress will act this year, Alba said she met with Pearce “to keep the dream alive” – so that, at some point down the road, reform will be possible. Cynthia Alba is similarly skeptical. The 18-year-old Mexican citizen shared her story earlier this year with Pearce in a meeting organized by CAFÉ, an organization that has focused for months on building support in southern New Mexico for immigration reform. Using a birth certificate belonging to another child, Alba’s mom walked with the 2-year-old across a bridge between Juárez and El Paso, Texas more than 15 years ago. They’ve lived in the United States ever since. Alba applied for and received deferred action status last year. She is working legally for the first time. While she’s worried that Congress won’t act on immigration reform and that the next president might revoke her deferred action work permit, she said having deferred action makes her feel safer. It protects her from deportation, at least for now. “I can’t be swept away immediately,” Alba said. Now that she can travel through the Border Patrol checkpoints around Las Cruces without fear of deportation, Alba said she wants to visit a dense, green forest, perhaps in Washington State. She’s never seen one in person. During an interview with NMID at her mother’s home in La Mesa, located in southern Doña Ana County, Alba said she told Pearce she and her mother struggled with loneliness when they came to the United States because they were leaving family. Others who cross without any documentation through the desert risk death, she said. Pearce told NMID he sympathizes with dreamers such as Alba who are “basically Americans.” He said he hears their stories constantly, and called Alba’s a “very sad situation.” But there are lots of people in the world with more tragic stories than Alba, and the United States can’t be the haven for the billions of people on the planet, Pearce said. Pearce proposes focusing on securing the border and streamlining the legal immigration system before offering legal status to those who live here without proper documentation. After the first two objectives are reached, he said he would let most immigrants who lack proper documentation stay if they want legal residency to work. Most or all who want a path to citizenship, he said, should return home and get in line. There isn’t a lot of common ground between what Alba wants and what Pearce proposes. CAFÉ and other activists are quick to point out that Washington has focused on security for years. They claim the border is secure. Alba said she doesn’t know how to bridge the gap and doubts Congress can do it this year. She said she met with Pearce “to keep the dream alive” – so that, at some point down the road, reform will be possible. “It’s like if you keep watering an empty pot with soil. Why keep watering it? Because eventually something is going to sprout. It may not be what you expected, but it’s there. It’s life,” she said. Gomez refuses to give up hope that reform is possible this year. She has been working with CAFÉ as she seeks change. She first shared her family’s tale publicly at a news conference in Washington, D.C. in February. Because she lacks legal status, Gomez can’t travel through border checkpoints around Las Cruces by car without fear of deportation. But she was able to fly from El Paso to the nation’s capital thanks to her New Mexico driver’s license. New Mexico is one of several states that lets immigrants, regardless of legal status, obtain licenses. Family members brought Gomez and her brothers across the Rio Grande to El Paso when they were small children. She lives in Anthony, N.M., today, and hasn’t returned to Mexico since. Neither had her brothers, until they were sent back last year to their country of citizenship – a place Gomez said was, for all practical purposes, foreign to them. The two struggled to find work in Juárez, Gomez said. She learned that they tried to reenter the United States when one called her family from jail earlier this year. Gomez noted that an American citizen who was with her brothers when they took the scrap metal is out of jail. That’s another aspect of the situation she said is unjust – the only difference between being released on bail and being imprisoned until deportation is legal status. Asked about Heinrich saying reform won’t help her brothers, Gomez was silent for a moment. When she spoke, she fired her words quickly, anger in her voice. She said she loves fighting for immigrant rights, but doesn’t think it’s fair that she can’t help her brothers live without fear of deportation in the nation they consider their home. Though it’s probably too late for Reymundo and Julio to have a shot at such a life, Heinrich said he hopes for reform that empowers immigrants to make better choices than Gomez’s brothers did. “Maybe the next time a couple of teenagers don’t find themselves in that kind of position in the first place, and have hope and focus on the future,” Heinrich said. Fronteras Desk, a New Mexico In Depth partner, is out with a radio report this week that tells the story of two sisters in an immigrant family who have different types of legal status.